Whether you are going Hiking or Hunting in the woods, self-protection should be given priority against the fun you are going to have in the middle of the beauty of nature. Legs and Feet are always the most in danger while walking down the trails in a forest due to a number of deadly living beings among which snakes are the most common. According to a study, 85% of the snake bites to humans happen below the knees. Wearing snake boots is probably the best way of protecting yourself from the deadly Snake bites. Though not every snake bite is deadly, protection is always better than cure. There are so many snake boots in the market but there are only a few that will not let even a single inch of any snake’s bite to hurt you. The most important things to consider while buying Women’s Snake Boots include its thickness, material used in the sole, length, waterproof or not etc. These were a few qualities that differ between every other snake boot and one should know her work and problems that she can face in regular shoes very well so that she can understand what qualities she require in a snake boot for herself. This way you will be able to buy the best Snake boot for yourself which will be protective from the snake and also helpful in many other ways for you. 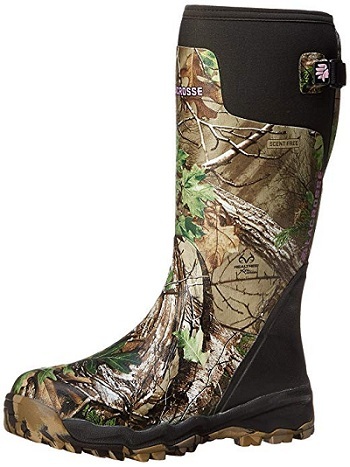 Lacrosse likes to make the best Rubber boots for hunting and hiking purposes which delivers comfort, toughness, and durability. These snake boots are also nothing different. These can save your feet and legs from snake bites and provide you with extreme comfort and flexibility at the same time. Adjustable Neoprene Gusset and Natural Rubber Compound are the main reasons of their comfortability and flexibility. The temperature range between which these snake boots work fine is also pretty wide, 0F – 70F, so that one can go out in the woods in any kind of weather without any hesitation. Naturally Insulating Neoprene Linen helps in circulation of air keeping your feet and legs cool, no matter how hot is the weather outside. 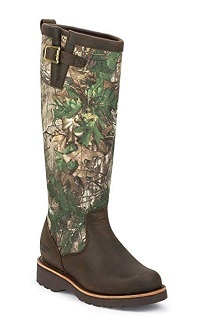 They come with almost every feature that a Hunting boot requires to have including shock absorption, heel lock, terrific traction, lightweight, durable, long, etc. Alphaburly Pro boots are definitely your perfect partner for your adventures in the Forest between the deadly ground creatures especially snakes. These boots will take care of anything below your knees and help you focus on your adventures in the lap of mother nature. Handlaid premium rubber over the 3.5 mm neoprene core makes them waterproof, scentfree and flexible. Adjustable Neoprene Gusset Provides active fit. Multilayer Rubber on the heel and toe and a double layer vamp for durability and added support. Embossed Liner for increased air circulation inside the boot for a cooling comfort to the feet and legs. 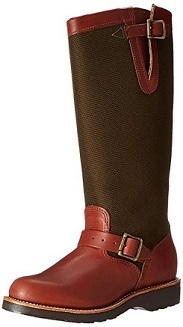 These boots make it into the "Top 5 Best Women's Snake Boots" because they are specially made for the protection against snakes and can withstand the bite of any poisonous snake because of the thickness of leather and lining. Leather welt doesn't let the water to come inside the boots and makes them somewhat waterproof too. One can easily rely on these boots for the protection against any kind of snake if going out in the wild. These boots provide a comfortable and flexible fit and freedom of movement on the trail. Their triple ribbed steel shank is more than enough for a fine stability. Whether the surface is dry or wet or whatever, these boots will get you going because of Vibram Robinson outsoles which are designed in honeycomb structure for the best possible traction. In addition, these have great abrasion resistance and slip resistance. Not even a single snake can touch your feet or leg even if you are in the middle of a bunch of snakes when you are wearing these Chippewa Snake Boots. Snake and any of the other deadly ground creature is no match for this Irish Snake Boot for women. Its size is 17 inch and hence provides protection from snakes to a good area of legs also. No matter how athletic you are and in how bad conditions you use these boots, they will not tear apart so soon just like any other snake boot in the market. These are so lightweight and high performance boots and completely do justice to their price tag. These boots come with ultradry waterproofing system which makes sure that your feet and legs stay dry for as long as you wear these boots. These boots also have the capability of killing the odor causing bacterias so that your feet don't smell when you take them off at home. Its RPM technology makes this snake boot lightweight and provides great comfort and a better endurance than other snake boots. These boots are made with such great care and quality material that no snake can bite through it. 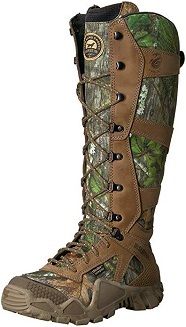 If you are an active and athletic hunter then these boots are perfect for you. Waterproof Components with moisture control lining for a long lasting dryness of feet and legs. Scent control process for killing odor causing bacteria. A non-woven material combined with nylon or leather to stop the snake, thorns or fangs penetrate through the boots. This boot is also made specially to protect your feet and legs from snakes. It can let you roam around freely even in a snake's country. These are definitely one of the best snake boots because of their unbeatable snake protection and many more great features at the same time. Its Snake Guard Protection and 1000 denier thick nylon provide reliable protection from any kind deadly creature hiding in the grass including snakes. It is also a waterproof boot which helps you roam around without any hesitation in the wet environment of forests. Its waterproof protection can keep your feet dry all day long. Furthermore, its Hyper-dry lining makes sure your feet are dry even when the outside weather is extremely hot. These boots are flexible and very comfortable and one can easily wear them all day long with their scent free interior which kills odor causing bacteria keeping your feet clean. It also comes with removable polyurethane footbed unlike many other snake boots which comes with fixed or low quality footbed. These are lightweight and you can easily run to your fastest while wearing these. If you are looking for a pair of all laced up long snake boots then these are surely one great choice. With these Chippewa Apache Snake Boots on, you are always ready for any kind of outdoor adventure. These are also completely snakeproof and comfortable for feet and legs and that's why they made it into our list of top 5 women snake boots. Chippewa has been in the business of producing high quality boots for a very very long time and you can easily trust them with these snake boots. 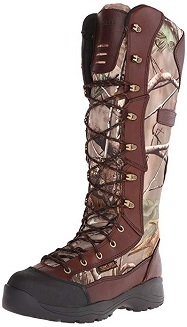 This boot comes with camo nylon upper and chocolate brown leather vamp with a beautiful and stylish look for women. Its 5 Iron Texon insole gives a lot of comfort to your feet. Outsole is also made of high-quality Vibram and is resistant from oil, gas, chemical, heat, abrasion, mark, and slip. If you are looking for a high quality yet beautiful looking snake boots of around 15" size for your next jungle adventure, Chippewa Apache Snake boots are a good choice at a good price.